Let Corefact help you become the best agent in town. Below is a free template just for you! The goal of this template is to keep you motivated and hold you accountable. Simply download, then fill out the required fields to complete your marketing plan for the year. Download and fill out this marketing calendar. Following it will keep you on the fast track to success. Update the calendar throughout the year with unplanned marketing, like your listings. You can schedule your planned marketing activities like direct mail strategies or newsletters right now. We recommend using at least three different methods; networking events, postcards, social media, etc. Find the methods that work for you and stick with it. After you've completed out your Marketing Calendar, download our Marketing Budget Spreadsheet and figure out how much you'll be spending on marketing this year. 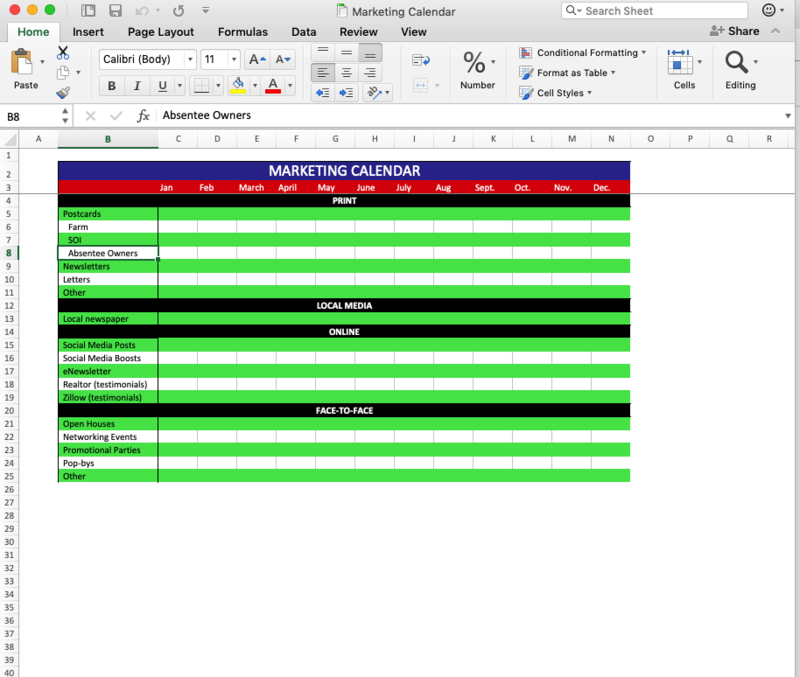 Download your free Marketing Calendar template here.